Edition of 1809 of which 125 copies are signed 1-125, 26 copies are signed A-Z as artist's proofs, three sets are signed as progressives and 6 are signed as dedication copies. Client:Chez Panisse Café & Restaurant, 1517 Shattuck Avenue, Berkeley CA 94709 Telephone 548-5525. The cherubic Athos was two-and-one-half years old when he watered my vegetable garden, modeling for this poster. 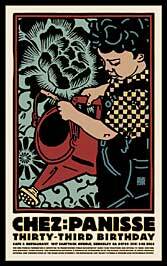 His reward for his labors was that he got to keep the watering can. Athos will probably not remember much, if anything, of early visits to my printshop, or playing at Totland or our trip to the zoo. He loves watching movies, and may have fairly good recollections of Toy Story, Pinocchio or Bug's Life, which he has watched about a million times each and can quote at length. As language develops and consciousness visits it mixed blessings, memory too will lock in, and he will begin to form permanent recollections of times we spent together, of the joys and tribulations of childhood, of birthdays and Christmas and Easter egg hunts. But the image of watering the garden on a summer afternoon will not remain. Here, grown-up Athos, is a picture of you watering my garden in the summer of 2004. I have remembered it for you.